This is The Cumberland Trio’s newest recorded original song, My Rockabye, an incredible folk ballad about the relationship between a mother and her child from birth to the empty nest and beyond. The performance is from the Trio’s Sept 24, 2004 reunion concert, Back Where We Began, at the historic Bijou Theatre Center, Knoxville, TN. This beautiful song was written by Barbara Short Haskew & her husband, Trio member Jerre Haskew, who sings the solo verses to this wonderful universal song. It was written less than a month before the concert and is it’s debut performance. It also includes a really funny improv between famed University of Tennessee college football mascot, Smokey, and the Trio’s own “Sam the Lion” played by Barbara Haskew. What happens is Smokey is lying at “Sam’s” feet, actually pinching it’s (Barbara’s) toes, and watch for yourself what “Sam” does to Smokey when he refuses to stop!!! This is really FUNNY and was totally improv!!!! 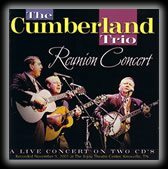 The Trio’s recorded music, including the DVD and double CD from this incredible 2 hour ++ live concert, is available at www.cdbaby.com, type cumberland trio in the search box. There are two minute samples of all 27 songs available to hear from this Back Where We Began concert, as well as similar samplings of all The Cumberland Trio’s recordings. The Trio’s great website is located at www.cumberlandtrio.com.